Application examples include ground water, ponds and wells. The general purpose two-wire pressure transmitter is offered in two configurations for different liquid types and provides contact level measurement up to 46' or 14m of water column. Select the LD31 for clean or relatively clean water, light weight oils and diluted chemical media. Application examples include ground water, ponds and wells. 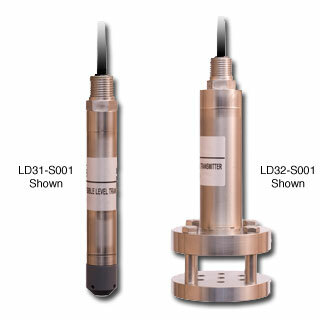 Select the LD32 for dirty, sludge or slurry media. Application examples include sewer or storm pump lift stations, storage and treatment with surface foam or debris where ultrasonic cannot be applied.